Welcome to the Bad Wolf Costumes analysis of the Star Trek: Deep Space Nine to Nemesis-era division shirt and its corresponding sewing tutorial! We primarily researched and analyzed the DS9/NEM division shirt for our sewing pattern, which is available for purchase from our Etsy shop, web site, and eBay store (see right), but we're happy to share our research and findings with you here, as well as the free sewing tutorial intended to accompany our pattern. A free downloadable PDF version of this analysis/tutorial is available here on the Bad Wolf Costumes web site for your convenience. 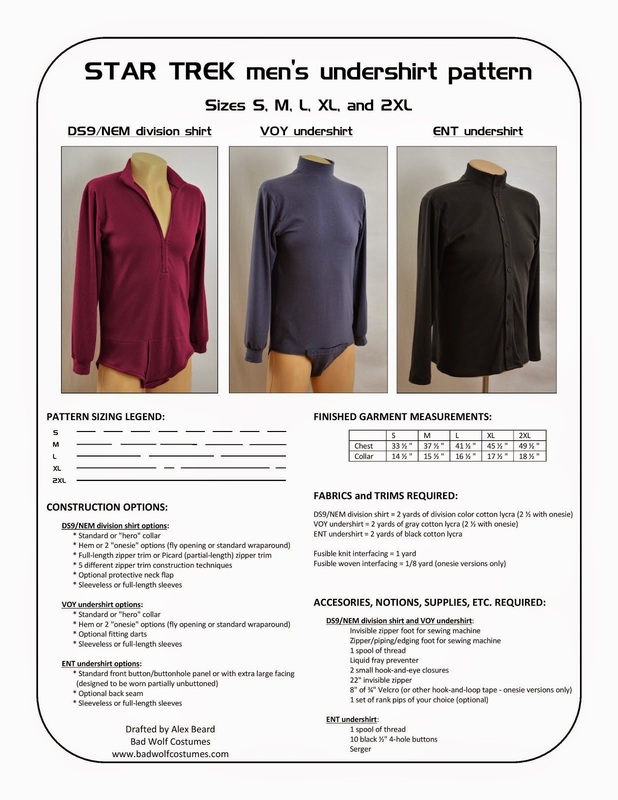 NOTE: We updated the ENT undershirt included with this pattern in October 2015, and as a result some of the pattern pieces' letter names changed! The letter names presented in this tutorial are for the updated version of the pattern! The construction process of the DS9/NEM division shirt is the same, though, as are the practical names of the pieces themselves. This analysis/tutorial is, at present, primarily focused on the male screen-used garments for observation; we plan on updating this blog with the relevant examples of female uniforms once our female undershirt pattern is released. Lastly, we'd like to extend a special thank-you to Michael Cowart for his consultation and inspiration, the Starfleet 1701st for being a wealth of information and its board members for contributing, and TrekCore for its enormous library of HD screencaps. Star Trek: DS9/NEM "Captain Jacket"
Star Trek: DS9/NEM "Captain Vest"